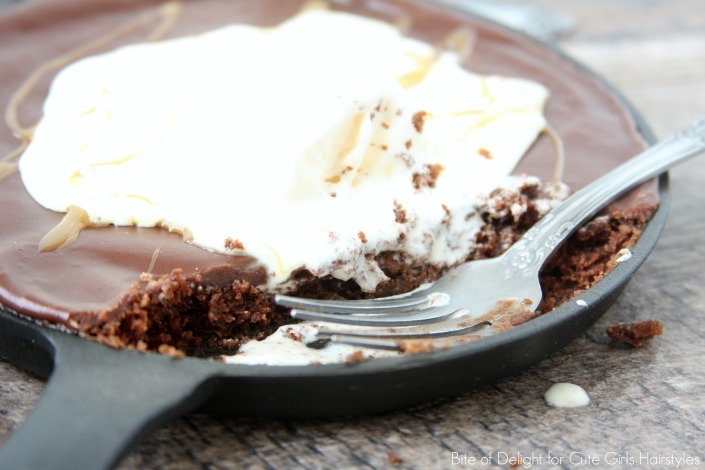 Texas Sheet Cake Mini Skillets are the perfect dessert to share with a friend! This recipe uses simple ingredients, but transforms into a wonderfully rich and delicious treat! Top with ice cream, chopped nuts and a drizzle of caramel sauce, and you’ll never go out for dessert again! My sister-in-law used to make Texas Sheet Cake all the time for family dinners. Oddly enough, she ended up moving to Texas! I used her favorite recipe, but I made a few changes to the ingredients, and then baked it in a fun, new way! After my husband tasted this version, he actually told her that we’d taken Texas Sheet Cake to a new level. And he’s right! It’s moist and delicious, and we probably won’t go back to the sheet pan. Preheat oven to 350° and lightly grease 4 6-inch cast iron skillets. Set aside. Brown the butter in a medium saucepan over medium heat. Once browned, remove from heat to cool for 2 minutes. While the butter is cooling, combine the flour and sugar in a mixing bowl. Set aside. Return the butter to medium heat and add the cocoa powder and water, stirring constantly until it just begins to boil. Pour the butter mixture over the flour mixture and combine slightly. Combine the buttermilk, egg, baking soda, cinnamon, vanilla and salt. Pour over the chocolate/flour mixture and thoroughly combine. Divide the cake batter among the mini skillets…about ½ cup batter per skillet. Do not overfill. You may have a little bit of batter left over. Bake for 12-14 minutes, or until a toothpick inserted in the center of one of the mini skillet cakes comes out clean. If you like gooey skillet cake, remove a minute or two early. Brown the butter in a medium saucepan over medium heat. Once browned, remove from heat and cool for 2 minutes. Return the slightly cooled butter to medium heat and add the milk and cocoa powder. Heat until just boiling, then reduce the heat and add the powdered sugar and vanilla and combine. Pour the warm frosting over the mini skillet cakes, dividing evenly. 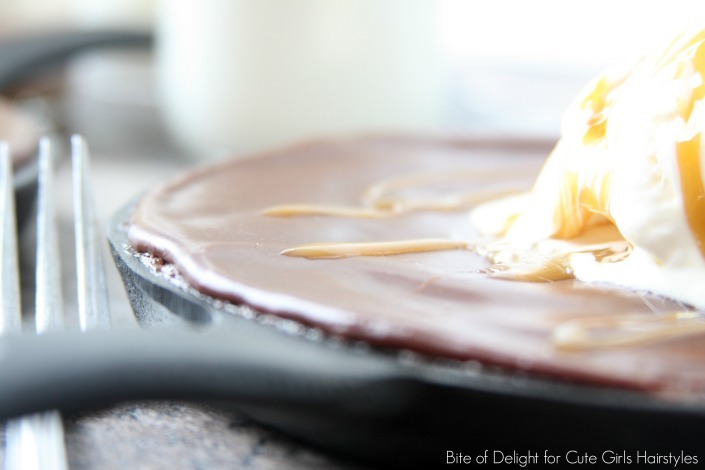 Immediately spread frosting with an offset spatula. The frosting will harden as it cools, so work quickly for best appearance. If you spread the frosting once it has begun hardening, it will not have a smooth surface. If desired, top with ice cream, caramel sauce and a sprinkle of chopped nuts! Serve warm, but also delicious if it’s cooled. A traditional Texas Sheet Cake has chopped nuts in the frosting. Two of my kids have nut allergies, so we leave them out of the frosting and sprinkle them on afterward for those who want them. Feel free to add ½ cup of chopped nuts (pecans are my favorite) to the frosting before you pour it on the cakes. Sheet cakes are typically baked in a sheet pan, hence the name. This is a classic sheet cake recipe, just in a different form! 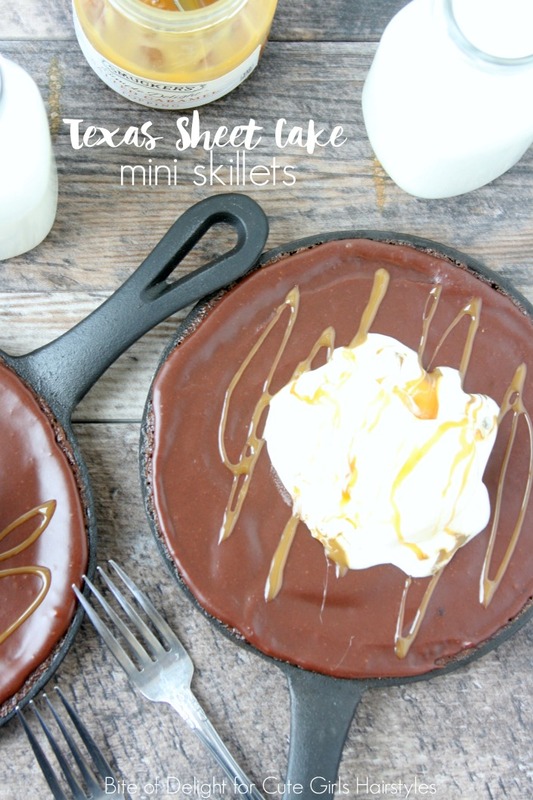 These Texas Sheet Cake Mini Skillets are the perfect size for sharing! The browned butter needs to cool before cold liquids are poured in, otherwise it will probably spatter all over your stove, and maybe even you. You don’t have to brown the butter, but I highly recommend it, as it definitely adds a richness to the cake that really makes it decadent!